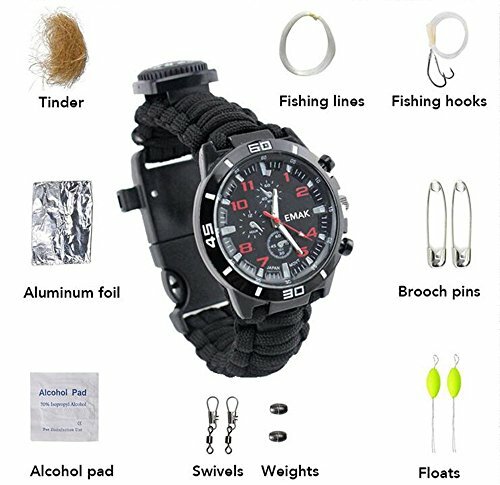 This Bracelet watch, small size, light weight, easy to carry, looks cool,can be wear on the hand.Bracelet contains eleven 12 essential tools concealed inside. After Rope kit is disassembled that is a 3.8M long rope Army Regulation seven core umbrella rope, bearing 250 pounds, can be used as an emergency lifeline.Seven core may be used alone deprived tied things hanging items, and bandaged wounds. There are fishing line, hooks, floats, fish catch, the connector that can be used as a fishing suit,to solve the food problem outdoor. Fire starter,tinder is a survival suit, make fire when camping.Whistle can be used for self-help. Needles,fishing line and alcohol pad is a medical kit for treating minor wound.Aluminum foil is used to hold water, reflective, warm, help,barbecue.